In a field where there's no room for error, you need the very best. 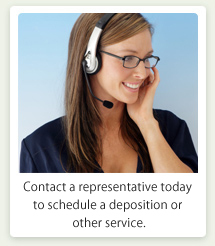 Need a video production team for your next deposition? Looking for a reliable, skilled videographer or video court reporting service? Get the San Francisco Bay Area's leading legal video service, McMahon & Associates. We specialize in providing the highest quality video depositions, mock video trial services and more for the the top law firms in San Jose and San Francisco, as well as for individual attorneys and court reporting services throughout the Bay Area. With over 20 years of production experience, we take pride in providing legal teams with the most professional video service available. McMahon & Associates is above all a service oriented company, dedicated to the valued customers we have accrued all over the world. We are known for our responsive, courteous staff, our attention to detail, and the legal savvy that comes from working with some of the very best lawyers that San Francisco, San Jose, and the world have to offer. Whether you need a settlement, day-in-the-life, or deposition video, or perhaps some other litigation or trial director support, McMahon & Associates is there with superior production values, competitive prices, and helpful staff. We also provide services including digital photography, video editing, site inspections, transcript sync, video and audio duplication, audio engineering and more. Get in touch today to find out more about how we can help!